Blogging since 2006 on learning technologies, custom elearning, instructional design and more from Kineo's Senior Solution Consultant. The 31 Days of this challenge is definitely dragging on. I'm losing my steam, but trying to stay somewhat on target. Darren Rowse of ProBlogger says, "I find that the most fruitful interactions that I’ve had with other bloggers don’t come as a result of me asking for something - but out of me giving something." This reminds me of a post I saw today at the Internet Time Community from Andy Jones: Give me a Lobster. It also makes me think of the whole gift-giving economy which is central to BurningMan, an arts festival and community that is created every year in the Nevada desert. It's nice to give gifts. And reaching out to someone to say hi can certainly add a little sunshine to that person's day. I know it does to mine. So go ahead and "Email or IM another blogger in your niche to introduce yourself and your blog". I did. My blog is not about making money. So I just skipped this one. Phew. I don't view this as a competition, nor does Darren. He says,"I use the word ‘competition’ hesitantly because the thing about blogging is that those blogging on the same topics as you are potentially your biggest allies. " I think we're all in this together. No competition. That said, I do think each of us finds his or her own niche. As Michele says, it's really about finding your own voice. I've got good awareness of what many other e-Learning bloggers are writing about. Beyond that, I think all I can do is provide my own take on things in a fairly transparent way. I want to share as much as I can about projects I'm working on. I've tried to post on things that I haven't been able to find much about when I've been doing research, figuring others might have the same info gaps. Get people to read more; get people to stay. The gist of this step is to add more links within posts to drive readers deeper into your blog, so they can see all the cool things you have to say and ultimately subscribe and become a regular reader. I've been doing this for awhile now, trying to give life to old posts that generated a lot of interest. You can also put an RSS link right into your most popular posts, making it really easy for them to sign up. I'm not sure I'll bother with that. Maybe I will. I don't know. Go to CrazyEgg and create a heatmap of your site. Pretty cool. Another gadget to look at. So I just signed up for it (it's free). One day's worth of data doesn't show you that much when you've got a little blog like mine with a fairly compact readership. We'll see what I see. I've been following your 31 day progress. Great insight into what is relevant for your particular blog and what isn't. I tried the CrazyEgg thing today, but couldn't get it to work for me. Another application I tried through another site I had problems with too, so it could be because I'm at work trying stuff out. Thanks for giving such detail about what each day is about, how you are handling it and what is working for your blog. I've loved reading these posts. As to CrazyEgg -- well, I'm not really sure if I've gotten it to "work" either. It takes a few days of waiting before you see any data results. I'm not sure if it does much for a site with minimal traffic. It's probably a great tool for doing analytics on a big website. The visual aspect of it is cool. Proud to be part of the Kineo team. 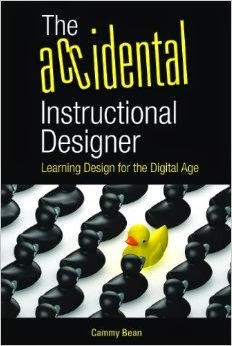 Are you an Instructional Designer? This work by Cammy Bean is licensed under a Creative Commons Attribution-Noncommercial 3.0 United States License. Based on a work at learningvisions.blogspot.com.